The 3rd side window on the new Malibu, as wells the fastback design, made me think of the Citation. Get over your hatchback fetish, Vince. 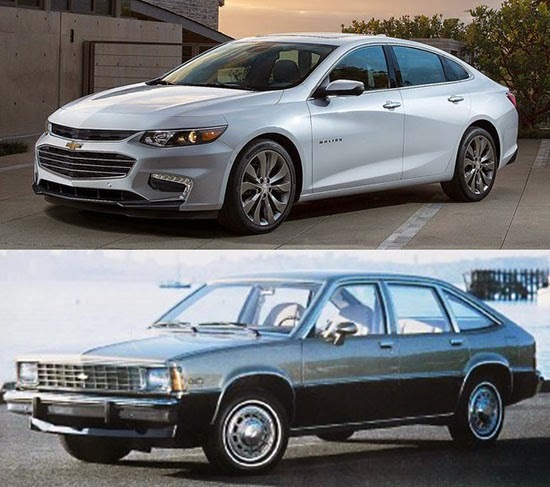 The original Malibu/Chevelle led (along with Celebrity) by way of the Lumina to the current Impala. I like this new approach to the Malibu but the double grill? Anyway I still like it and it will help GM will sell a lot of these. Would never consider this. Very disappointed. Vince is right. Two gens ago much more handsome. I came across a photo of an early 1990's Winnebago this morning. Comparing it to a head-on shot of the new Malibu, you'll see their double grills are all too similar. I don't agree with you on this one. I don't believe there is a significant market for a mainstream midsize sedan with a hatchback opening in the U.S. market. U.S. buyers tend to want either a midsize sedan with a trunk or a taller crossover vehicle with a hatchback opening. While I agree that a hatchback opening on a sedan would increase the utility and versatility of a sedan, I don't think the concept is in line with the tastes of U.S. consumers. I think you're fighting a losing battle with this one. At least the Citation was a two-tone.